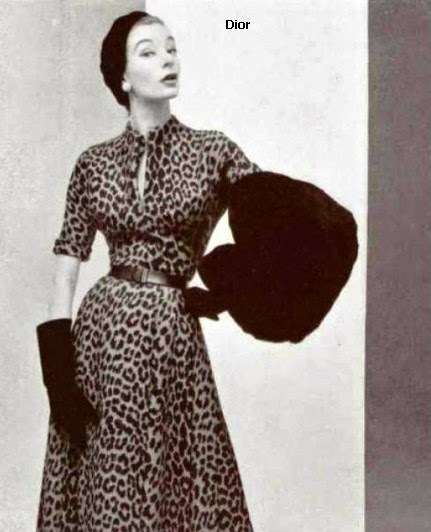 When I first started sewing for Gene in 2003, I looked everywhere for pictures of vintage fashions. I found this outfit in a library book. 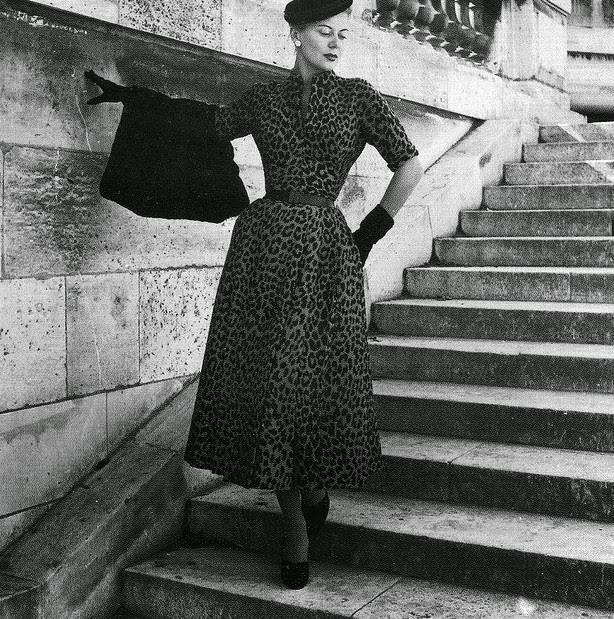 This outfit is from Christian Dior's 1952-1953 Profile Line. I knew I had to make it. My attempt to recreate the original photo. If only I had a set of stairs for my dolls. In 2005 I made this ensemble. Years later, I came across this photo in a L' OFFICIEL magazine. I took a better look at the other photo of this outfit and noticed that the dress looked like a wrap dress. In my version, the skirt edge has more of a diagonal to it than Dior's does. I straightened that line a little for the pattern. I had enough of the original fabric to make a couple of dresses with my new pattern. I succeeded in washing out Gene's face again. I tried this dress on all my different 16" dolls. The dress doesn't overlap as much in the front on Brenda Starr as it does for Gene, but it works. I have added alterations to the pattern so the dress will fit the Tonner/Tyler dolls better. The alterations should also work for the Franklin Mint Grace Kelly dolls. The 16" Fashion Teen Poppy Parker doll looks great in this outfit too. Of course while I was finishing up the animal print dresses, I started wondering how this pattern would look in a cotton print. I added a different collar and omitted the sleeves. I reduced the diagonal line on the skirt for this version too. It turned out great! I love showing how versatile my patterns can be. Even though the dress looks awesome on all the other dolls, including Gene, Madra owns this look.